When we woke up three days in a row thinking about Little Red Fox’s terrific cold drip coffee we realized we had a real problem. The cold drip coffee, brewed in an apparatus that would look at home in a science lab, is just that good — this isn’t yesterday’s coffee with a few ice cubes tossed in. The overnight, slow drip technique produces a gentle, flavorful brew, where the bright, sweet berry notes of the coffee beans shine through. No milk or sugar is needed here, as the cup comes perfectly balanced. Served in a dainty little glass, and ideal for sipping outside on a warm afternoon, the cold drip is our go-to after lunch beverage in Siem Reap. Little Red Fox in Kandal Village serves Siem Reap’s favorite coffee. From time to time, Little Red Fox Espresso also has a single origin bean in stock for cold drip — when we visited, it was an organic bean from Laos — and it’s worth trying if they’ve got it. 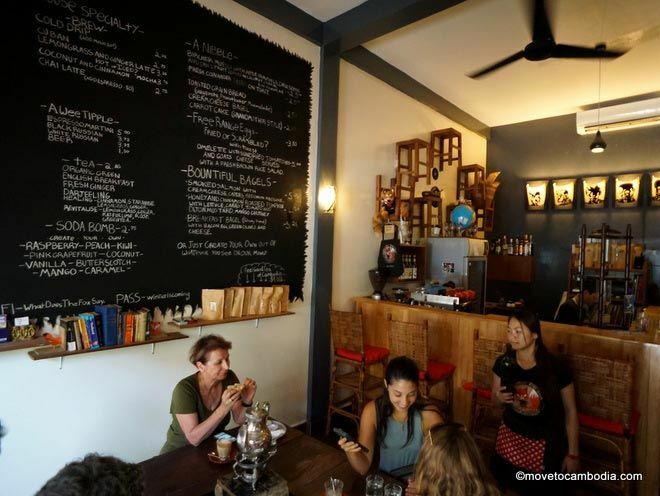 True to its name, the cafe serves an array of espresso drinks, flat white to americano, all made expertly by the Australian and Khmer staff, and both skim and soy milk are available. Or switch things up entirely and try a Cuban coffee, something you don’t see much of on coffee menus in Cambodia. Like many other specialty cafes in Cambodia, the Little Red Fox sources its beans, including the single origin roast, from Feel Good in Phnom Penh. 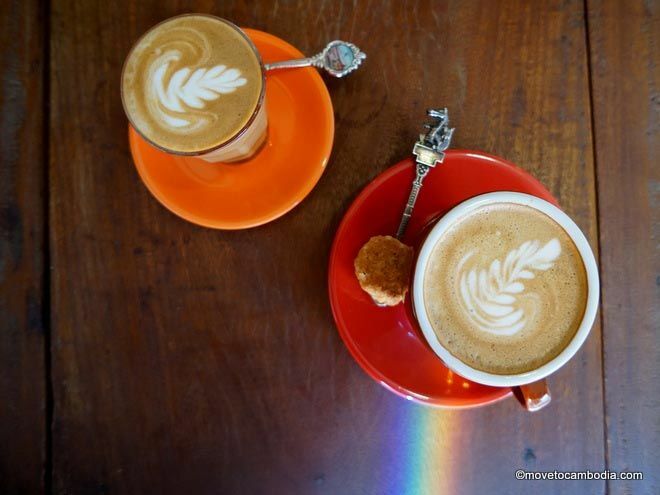 Little Red Fox flat white, latte, and rainbow. Along with the coffee, there are made-to-order sodas and a simple menu of housemade chia seed muesli, toasties, and other brunch goodies and snacks, which, when supplies are available, include vegan options and a gluten-free carrot cake that several people we met swooned over. (Though it had good flavor, the texture was too dense and crumbly. As gluten enthusiasts we thought it was lacking just that.) When the gluten-free cake isn’t available, they serve a gluten-rich version that we think is far superior. We are also fans of the smoked salmon bagel, served with sliced smoked salmon, cream cheese, capers, red onions, and a slice of lime. 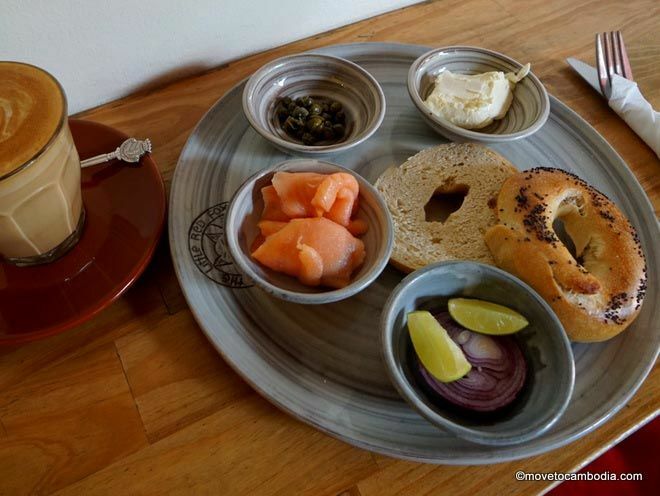 The smoked salmon bagel is someone’s (*ahem*) favorite breakfast in Siem Reap. The space is small, with bar seating and a long, counter-like area for sitting or standing around with your caffeine. A low wooden table and a few small stools stand in the center of the room, and there’s also seating at the bar, where you can watch the espresso being made, or check out what’s playing on the vinyl turntable. The walls are adorned with a rotating selection of art from local artists — right now an exhibition of woodblock prints. The small coffee shop usually has at least a few people there, and space can be at a premium, but there are also a few tables outside where you can enjoy a brew. Service is welcoming and friendly, and the location in the quietly hip Kandal Village arts district can’t be beat. (“I love this street,” we heard one of the owners say after enjoying an iced coffee on a stool across the road from his shop and providing directions to a few passers-by.) Opened in October 2014, it’s easy to see why this spot has quickly become an expat favorite. Cold brew is $2, $2.50 for single origin, and espresso drinks start at $2. Little Red Fox isn’t just a coffee shop; it’s also one of the best hair salons in Siem Reap. Upstairs David Stirling cuts and colors. He’s popular, so be sure to make an appointment in advance. Open daily, 6:30 a.m. to 5 p.m. Closed Wednesdays. This entry was posted in Siem Reap, Food and tagged coffee, Feel Good, Little Red Fox. Bookmark the permalink.